I woke up this morning and quickly got my painting supplies ready. I got in the car and headed to this one place I picked out previously. I parked the car and set up my easel. In the beginning stage of a painting, I'll do a wash and loosely block in certain shapes. A wash is just mineral spirits and a color I choose to tone the canvas, this time I used raw sienna. 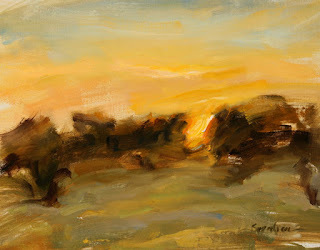 When the sun was at this point, shinning through the trees, I moved my easel so I could paint without the glare. This painting looks abstract but it truly is a loose interpretation of what I was seeing.